Conium (/koʊˈnaɪ.əm/ or /ˈkoʊniəm/) is a genus of flowering plants in the carrot family Apiaceae which consists of four species accepted by The Plant List. 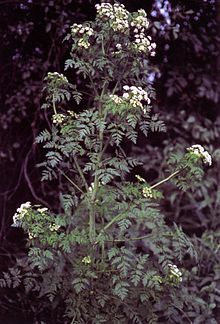 One species, C. maculatum, also called hemlock, which is highly poisonous, is native to temperate regions of Europe, North Africa and Western Asia, while the other three are from southern Africa. ^ “No good reasons appear to have been advanced for maintaining the southern African representatives of this genus as a separate species (C. chaerophylloides), and accordingly it is here reduced to synonymy.” “Flora Zambesiaca volume:4 part:0 (1978) Umbelliferae by M. L. Gonçalves”. eFloras. Kew.